Overview: On an average day in Smallville, USA, Clark Kent is accosted by three strange teenagers who claim to know his secret identity. The teenagers reveal themselves to be Cosmic Boy, Lightning Lad, and Saturn Girl. They are from 1,000 years in the future, and have been inspired by Superboy/Superman to use their unique super-powers to help Earth and other planets. Thus, the Legion of Super-Heroes is born. Long live the Legion! 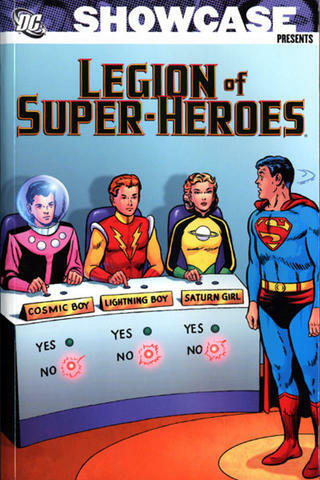 Meeting in a converted rocket ship-turned-clubhouse, the Legion of Super-Heroes is made up of teenagers, each with a unique set of powers and abilities. No duplication of powers is allowed, although they tend to wiggle the rules on that from time to time. Over the six-year time frame of the stories collected in this volume, we meet 20 Legionnaires, plus all of the would-be Legion members and their spinoffs, such as the Legion of Super-Pets and the Legion of Substitute-Heroes. Some prominent foes are introduced, including the Legion of Super-Villains. Their initial line-up was older family members of the Legion founders, all with the same power set. The mysterious Time Trapper comes into play at the end of this volume, and will revisit many times over, only to be thwarted by the Legion. Why should these stories be Showcased? : I’ve been pretty honest on my opinions of the DC Silver Age stories. Most stories are hard to read against today’s standards. But even so, these Legion stories are a real treat. The stories can be absurd, yes, very much so. But they still retain a youthful innocence that compels the reader to want to keep reading. Who wouldn’t want to hang out in a super-hero clubhouse with other teenagers with wonderful powers and abilities. Sign me up! Footnotes: The Legion stories in Action Comics #267 and #276 are also reprinted in Showcase Presents Supergirl Vol. 1. The Legion stories in Action Comics #287 and #289 are also reprinted in Showcase Presents Supergirl Vol. 2. The Legion story in Superman #147 is also reprinted in Showcase Presents Superman Vol. 3. If you like this volume, try: Superman and the Legion of Super-Heroes by Geoff Johns and Gary Frank from 2008. This story originally ran in Action Comics. Geoff Johns combines story elements from the 50 year history of the Legion to tell a great story of Superman traveling into the future to visit his friends from his teenage years. But in the year 3008, Earth’s sun has become red, and Superman’s name is synonymous with treachery. The Legion has moved underground, considered to be outlaws by the local authorities. Superman gathers together all of the Legionnaires that he can find to lead an attack against the Justice League of Earth and restore the proper order on the planet. The art is by Gary Frank, creating a realistic look to his figures and in particular his faces. This is worth tracking down, as it gives you a good overview of the entire Legion lore. This entry was posted in DC Showcase Presents, Legion of Super-Heroes and tagged Al Pastino, Curt Swan, Edmond Hamilton, George Papp, Jerry Siegel, Jim Mooney, John Forte, Legion of Super-Heroes, Otto Binder. Bookmark the permalink. Pingback: Throwback Thursday – Showcase Presents Legion of Super-Heroes Vol. 1 – WORST. COMIC. PODCAST. EVER!